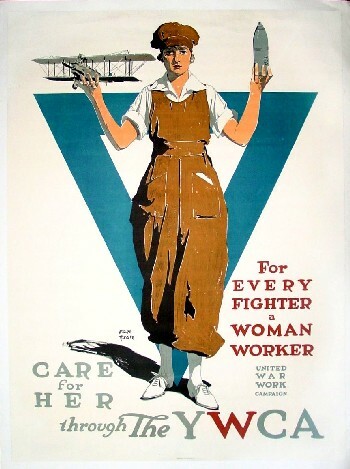 Comments: This poster has a wonderful image of a young girl in work overalls holding a biplane and bomb! The artist Arthur Triedler later married the attractive model for this poster. The yeomen World War I efforts of women gave a real boost to women's rights and the 19th Amendment which gave women the right to vote was ratified shortly after the war. This beautiful YWCA poster will only increase in value. Condition: Linen mounted, fine color, superb presentation with some tears repaired during the linen mounting process.